Bede (c. 673-735) was Anglo-Saxon England’s most prominent scholar, and his body of work is among the most important intellectual achievements of the entire Middle Ages. Bede and the Future brings together an international group of Bede scholars to examine a number of questions about Bede’s attitude towards, and ideas about, the time to come. This encompasses the short-term future (Bede’s own lifetime and the time soon after his death) and the end of time. Whilst recognising that these temporal perspectives may not be completely distinct, the volume shows how Bede’s understanding of their relationship undoubtedly changed over the course of his life. Each chapter examines a distinct aspect of the subject, whilst at the same time complementing the other essays, resulting in a comprehensive and coherent volume. In so doing the volume asks (and answers) new questions about Bede and his ideas about the future, and will undoubtedly stimulate further research in this field. 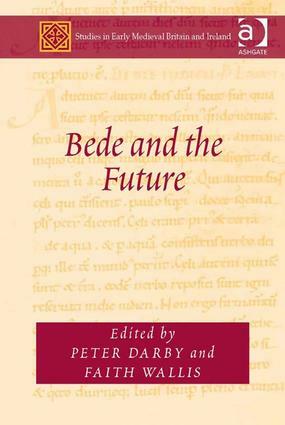 Contents: Foreword; Introduction: the many futures of Bede, Peter Darby and Faith Wallis; Why did Bede write a commentary on Revelation?, Faith Wallis; Why did heresy matter to Bede? Present and future contexts, Alan Thacker; Separation anxiety: Bede and threats to Wearmouth and Jarrow, Christopher Grocock; Bede and Islam, Calvin B. Kendall; Bede’s history of the future, Peter Darby; The ends and futures of Bede’s De temporum ratione, James T. Palmer; Christology and the future in Bede’s Annus Domini, MÃ¡irÃ­n Mac Carron; Quae res quem sit habitura finem, posterior aetas videbit: prosperity, adversity and Bede’s hope for the future of Northumbria, Paul C. Hilliard; Visions of reform: Bede’s later writings in context, Scott DeGregorio; Bibliography; Index. Peter Darby is Lecturer in Medieval History at the University of Nottingham, having formerly held a British Academy Postdoctoral Fellowship at the University of Leicester. His research interests focus on ecclesiastical history, with a particular emphasis upon Anglo-Saxon England and the writings of Bede. He is the author of Bede and the End of Time (Ashgate, 2012). Faith Wallis is Associate Professor in the Department of History and Classical Studies at McGill University, Montreal. She has written widely on the history of science and medicine and has published translations of Bede’s On the Reckoning of Time, Commentary on Revelation and (with Calvin B. Kendall) On the Nature of Things and on Times. Studies in Early Medieval Britain and Ireland illuminates the history of Britain and Ireland from the start of the fifth century to the establishment of French-speaking aristocracies in the eleventh and twelfth centuries, for historians, archaeologists, philologists, literary, visual and cultural scholars. It explores the origins of British society, of communities, and political, administrative and ecclesiastical institutions. It was in the early middle ages that the English, Welsh, Scots and Irish defined and distinguished themselves in language, customs and territory and the successive conquests and settlements lent distinctive Anglo-Saxon, Scandinavian and Norman elements to the British ethnic mix. Royal dynasties were established and the landscape took a form that can still be recognised today; it was then too that Christian churches were established with lasting results for our cultural, moral, legal and intellectual horizons. Studies in Early Medieval Britain and Ireland reveals these roots and makes them accessible to a wide readership of scholars, students and lay people.